Get inspired by Chanel’s classic yet casual 2017 resort collection. Chanel’s 2017 Resort Collection is a good one. It’s immediately identifiable as Chanel – the quilted bags, the bouclé, the black skirt suits – yet it’s also casual, summery and comfortable. On the runway (which was an avenue in Havana, Cuba, BTW! ), models wore flats – brogues and slider sandals featured prominently – and there were even graphic t-shirts involved. This collection is the perfect inspiration for easy summer looks that are on trend, yet classic at the same time. Now, I don’t think I’ve ever matched my bag to my dress (unless I’m wearing all black, which to be honest is almost every day), but this outfit makes me immediately want to give it a whirl. 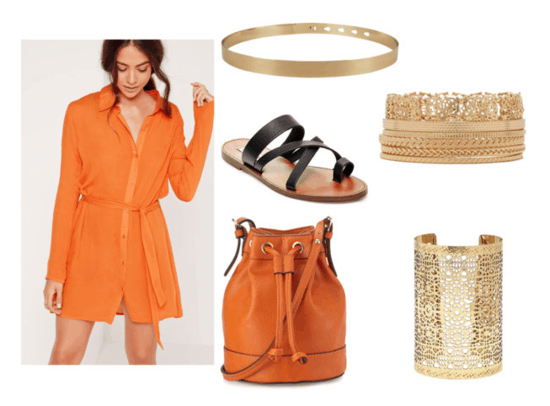 A classic looking shirt dress gets an update with an amazing orange color, and paired with gold accessories, it’s perfect for summer! Yellow has always been my absolute favorite color so it makes me so happy to see yellow clothes on the runways! Yellow items were a bit of a struggle to find growing up, as my parents would tell you with weary looks on their faces as they remember my childhood tantrums. 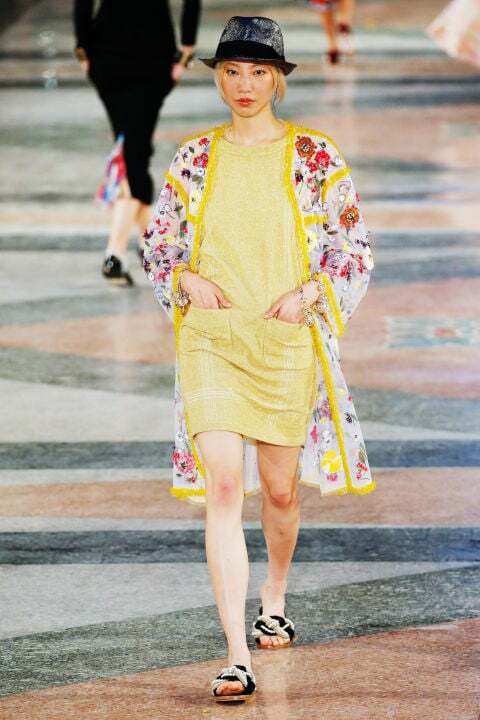 Anyway, I love yellow and I love kimonos so this look was always going to be a winner for me. Slider sandals make it very on trend, and the black accessories add a bit of edge to an otherwise girly look. Look #3: This is how Chanel does t-shirts. This look, on paper, shouldn’t work. Acid wash/cloud print/paint spattered jeans, a graphic t-shirt, brogues, a trophy jacket and a prim and proper handbag? It sounds absurd. But something about it just works. In fact, this look is the perfect balance of casual and classic. To make sure it doesn’t all get a bit too much, try to stick within the same tones. Chanel kept within the same color scheme with yellow, pink and blues, and I tried to stay with pinks and purples and reds. Do you like Chanel’s 2017 Resort collection? Would you wear these looks? Which is your favorite? Let me know in the comments!